The snowman ice cream egg waffle at Wowfulls. From simple holiday classics to over-the-top confections, here are some of the most indulgent-worthy desserts in New York City this season. The holiday doughnuts at Doughnut Plant. The Rudolph and snowmen Hong Kong egg waffles at Wowfulls. 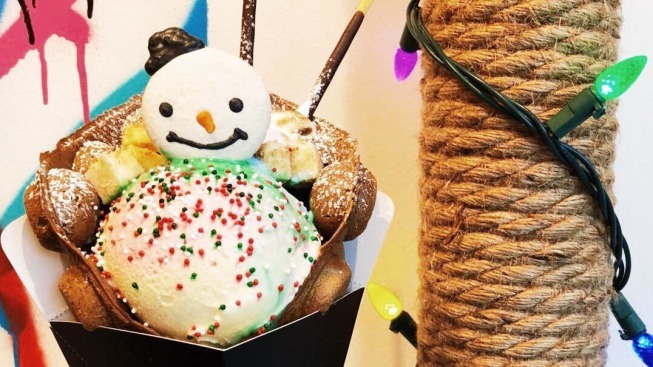 The red velvet holiday cones at Taiyaki NYC. The happy holidays cone at Amorino USA. The Christmas cannoli cake at Rose and Basil. The peppermint-cornflake-chocolate-chip cookies at Momofuku Milk Bar. The peppermint brownies at Baked NYC. The Santa religieuse at Dominique Ansel Bakery. The egg 'n' grogg pie and cranberry sage pie at Four & Twenty Blackbirds. The mint bonbons at Lafayette Grand Cafe & Bakery. Bonbons for a special event @lafayette380. The white chocolate candy cane pretzel cookies at Maman NYC. The Christmas cake at Patisserie Tomoko. The checkerboard holiday rolls and persimmon cloud pie at Petee's Pie Company. The holiday cookies at Milk & Cookies Bakery. The gingerbread ice cream pie and figgy bread pudding at Ice and Vice. The dirty peppermint cookie at Schmackary's. The holiday macarons at Bibble & Sip. The holiday cupcakes at Sprinkles Cupcakes. The candy cane ice cream at Ample Hills Creamery. The peppermint cupcakes at Magnolia Bakery. The nutty professor churro at Chikalicious NYC. The peppermint croissant at Union Fare. Peppermint Croissants w/ candy cane filling! ❣️ Find em’ in our bakery. 8am, daily. The raspberry chamomile chiffon doughnut at BESFREN. The peppermint fudge brownie jar at JARS by Dani. The cozy gingerbread canoli at Gelso & Grand. The marzipan snowmen at Betty Bakery. Guess who’s back! ⛄️☃️⛄️Marzipan snowmen are here for the season. The gingerbread cookie dough and hot cocoa bomb at DŌ.